Ever since lasers were invented almost 60 years ago, they have been used in welding, drilling, cutting, forming and other manufacturing processes. A new generation of lasers has been developed in the past few decades. 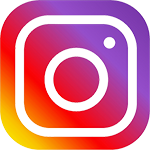 Commonly referred to as “ultrafast lasers” or “ultrashort-pulsed lasers,” this type of laser can output flashes of light (“pulses”) that have very short pulse duration (< 1 picosecond). This period of time is so short that thermal energy, which is the main cause of collateral damage using other types of lasers, cannot dissipate too far from the laser irradiated region. The result is that the precision of laser processing can be improved to micron or even nanometer scale, enabling new applications including eye surgery, cutting display panels, and the fabrication of medical implants. Despite the unparalleled precision, so far ultrafast laser processing is largely considered as a slow fabrication method. This is because in most cases the laser beam is focused to a single “spot” (“Gaussian focus”) in space, which limits how fast the laser beam can cover a large area or volume. One way to increase processing speed is projecting a 2D image instead of focusing to a single spot. This is a laser beam shaping technique and it can increase the processing speed for 2D patterns that are on the transverse plane (perpendicular to the laser propagation direction). However, for complex 3D structures, it is necessary to extend the technique to the axial direction (parallel to the beam propagation). 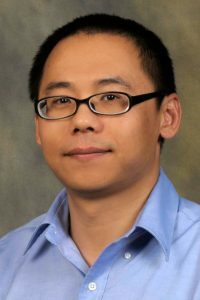 Recently, a collaboration between Xiaoming Yu’s group and Stephen Kuebler’s group (with external collaborators) applied the spatial beam shaping technique to the axial direction, and greatly reduced the processing time for fabricating structures that have a high aspect ratio (narrow in width and tall in height). The laser beam used by the team is called the “Bessel beam” (Figure 1). The key advantage of a Bessel beam is the long depth of focus, which is important for producing structures like thin fibers and walls. Finding the correct beam shape is only one piece of the puzzle. In order to fabricate tall structures, the laser beam needs to penetrate deep inside the material. The team utilized a process called “two-photon polymerization (2PP)” by which a liquid photopolymer (“resin”) solidifies when it absorbs laser energy. The unique feature of 2PP is that the chemical reaction that drives the transition only takes place when the laser intensity reaches its peak, so the other part of the beam is nearly unaffected. 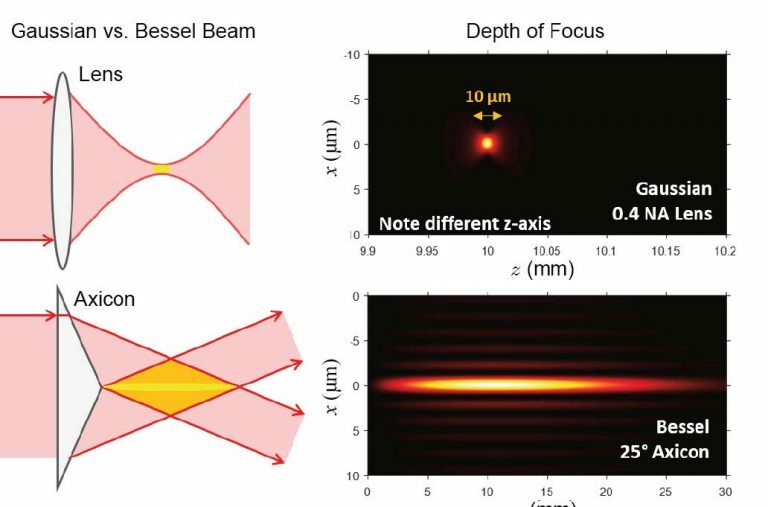 The team’s idea was that by combining Bessel beam exposure with 2PP, high-aspect-ratio structures could be fabricated using a single or a few exposures, so the fabrication time could be a fraction of what it normally takes using the conventional Gaussian beam. The team used the setup shown in Figure 1 to demonstrate this idea. The setup is similar to other two-photon polymerization methods, except that the lens, which is used to produce a Gaussian focus, is replaced by an axicon that produces a Bessel beam. Using this setup, the team is able to fabricate microstructures at a speed much faster than before. One example is shown in Figure 3(a-b), which shows polymer fibers that are fabricated without changing the relative position of the laser and the resin. 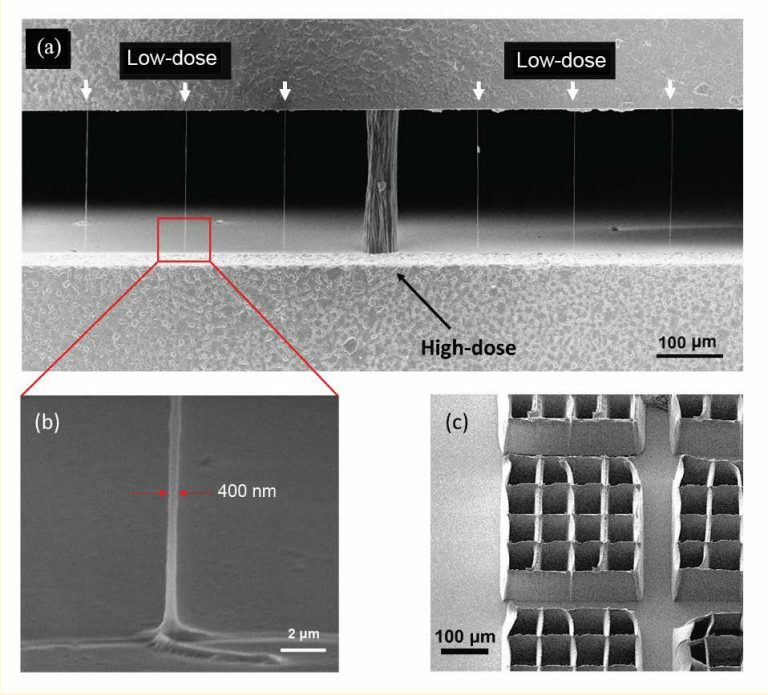 At low dose (low laser power and short exposure time), polymer fibers with width as small as 400 nm are fabricated. These are among the thinnest structures ever fabricated using Bessel beam exposure. At high dose, the teams observe a completely different type of structure, which looks like a tree trunk. The length of these fibers is >200 μm, and for the thinnest fibers, this yields an aspect ratio >500. Such high-aspect ratio structures are time-consuming to make using conventional Gaussian beams. 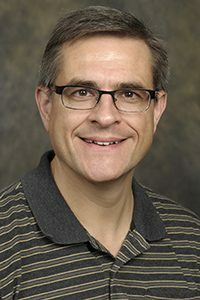 Using data published by other researchers, the team estimates that Bessel beam polymerization is approximately 200 times faster. The team also tried to use this setup to fabricate more complex structures. By scanning the Bessel beam in the direction perpendicular to the beam propagation direction (transverse plane), the team fabricated mesh-like structures (Figure 3(c)). If Gaussian beams were used to fabricate the same type of structures, multiple layers would be needed to build from bottom to top. By taking advantage of the long depth of focus of the Bessel beam, the team was able to fabricate these structures using a single pass, which again reduced the fabrication time. Obviously, the quality of these structures is not as good as those fabricated using commercial machines, but the team is improving the quality including geometry accuracy and surface roughness by studying the mechanism of Bessel-beam-activated polymerization. 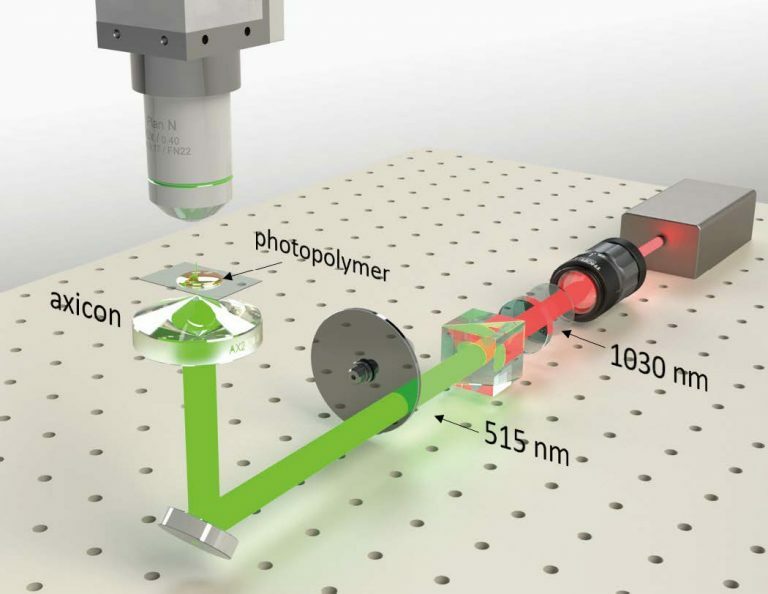 They believe that by extending laser beam shaping to the axial direction and combining the image projection technique, people could one day 3D print an object instantly in a way similar to holography.